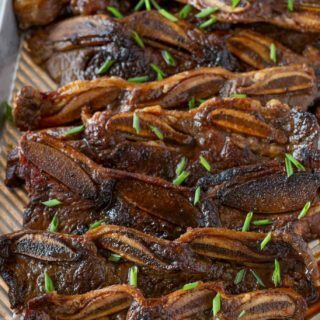 Korean Kalbi BBQ Short Ribs are incredibly flavorful and sweet, made from flanken short ribs marinated all day long in a soy garlic marinade with grated pears and grilled to perfection! Mix all the ingredients together and marinate for at least 24 hours then drain from the marinade before cooking. Cook in the oven for 12-14 minutes at 400 degrees then broil for 1-2 minutes OR heat your grill to medium high and cook for 4 minutes on each side.